This pattern is pretty much the easiest pattern ever: it’s a rectangle. The end. It’s great for beginners! Great for kids! Host a holiday crochet party where everyone makes one crocheted candy and then string them all together to create a group garland! Or, everyone can keep their own candy and string them as ornaments. I will probably glue pinbacks and hair clips to the backs so that I can wear them. 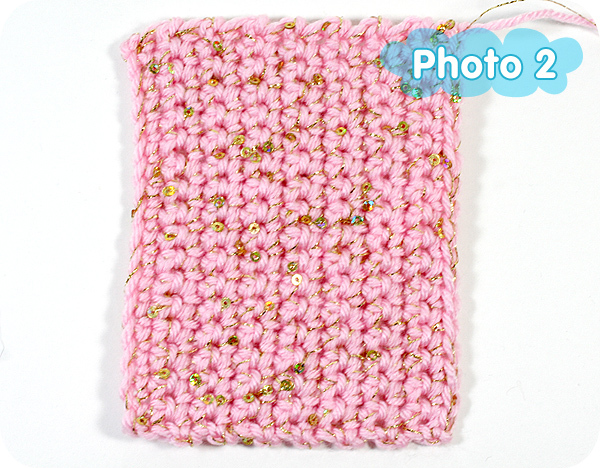 There are a lot of possibilities with just one little crocheted rectangle! For more advanced beginners, you can get some great striping. You can alternate different colors every other row, and carry the unused yarn. Or, you can alternate colors ever 2 rows, and just drop the unused yarn and pick it up on the way back. 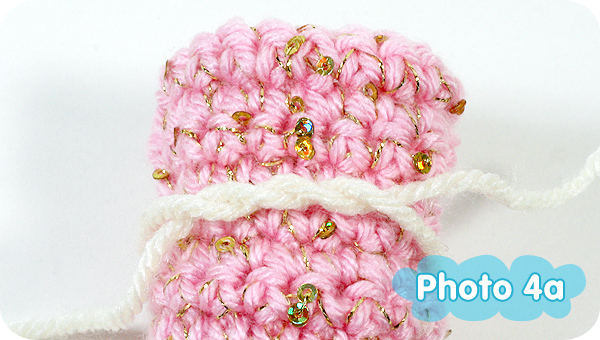 Working a thin sparkle or sequin yarn with your regular yarn also and some subtle bling. Either way, all you need is a little bit of yarn and a styrofoam ball to get going! I also tried filming a video tutorial for this. People have been asking me to do videos, but they are quite a bit of work, so I haven’t really been super eager to get on that task, since I do everything 100% by myself. But since this project is SO EASY, I thought it would be a good ice breaker for me to film a video and for you to break out some crochet hooks! Worsted weight yarn is the easiest to use for beginners, but this pattern can be used for any weight yarn. Click this link to download the pattern and print it out. Click this link to download only the rectangle template. Gauge isn’t really important in this project. 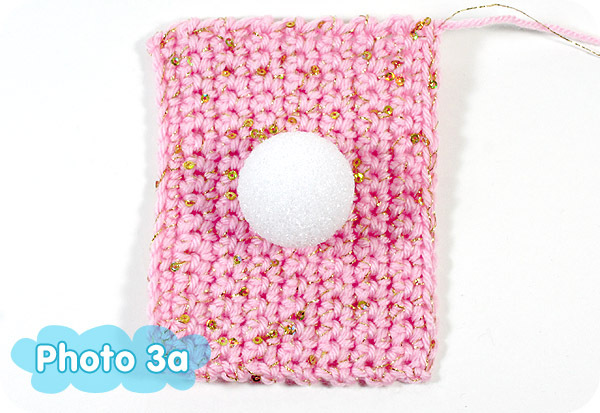 For a 1 ½ inch Styrofoam ball, you want your crocheted rectangle to be 4 ½ inches wide and 3 ½ inches long. See template at the end of the pattern. – Break off, leaving about 18 inches of yarn for sewing. – To hang as an ornament, simply loop some gold thread, invisible thread, or, or an ornament hook to the center of the candy. 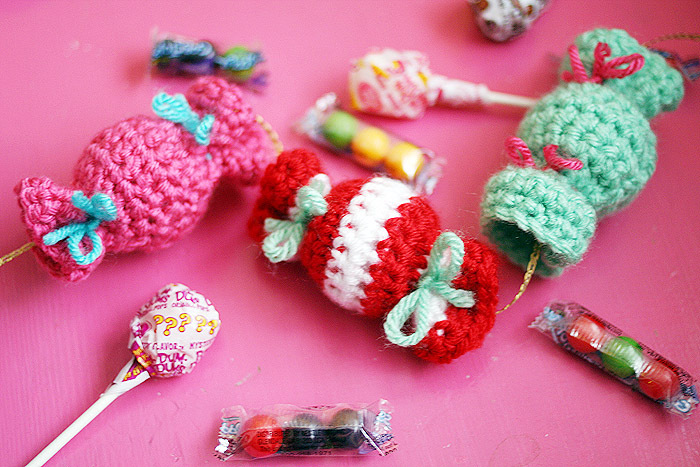 – To create a garland, work about 12 crocheted candies. You have many options for stringing the garland. You can simply thread some yarn through a big tapestry needle (long enough to pierce your Styrofoam ball and come out the other side) and sew the candies together, or you can use a thin, sparkly gold ribbon, leaving space in between each candy. 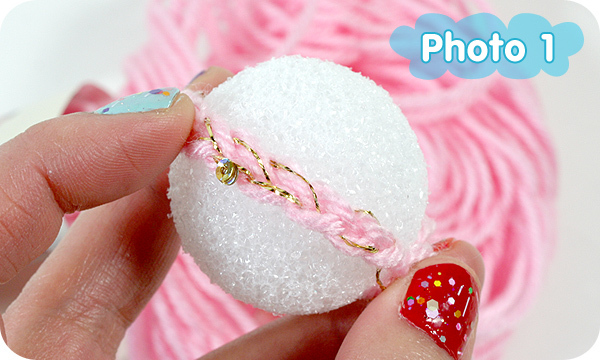 Or, you could string a bunch of colorful or sparkly beads between each candy, or even use colorful pompoms as spacers. 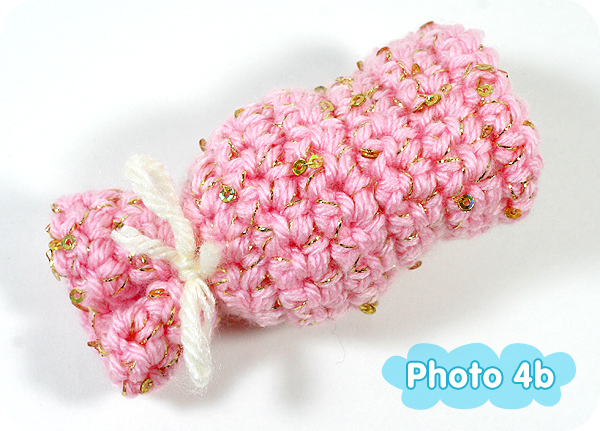 This entry was posted in Crochet, Patterns & How-To's, Videos and tagged free pattern. Bookmark the permalink. Thank you for sharing this! I have liked these since you showed them for your class. WOOOHOOO!!!!!! I’ve been waiting for this! Thank you!!!!! Thank you for sharing such a sweet cute pattern, I love it. May your holidays be happy, merry and brite. Super cute and your sewing + bow skills were awesome too! Compared to knitting I think I like crochet better, it definitely feels firmer, I know my first knitting experiments were a right royal mess but crochet seems more forgiving. Will hopefully try again but even if I don’t I have an awesome beret and heart pin to wear! I just need it to get cold enough here in Australia for the beret! Ahh sorry this so long just super excited and I wanted to say a huge thank-you! Your skills our beyond amazing and I have a totally new found respect for what you do! Pingback: Advent, Advent, im Häkeltrend | alyceen. http://instagram.com/p/ip4sVaF-gX/ here is a pic of how they turned out. Now I just need to look up how to do stripes! Can I use felting wool to stuff it? Felting wool in a ball?